How and when did you first become interested in PR and communications? My freshman year of college I declared a communications major. I enjoyed my classes but was feeling unsure of what a career with a communications degree looked like. My adviser at NMU suggested I consider switching to pubic relations and showed me the variety of career paths it offered. Not only that, he introduced me to PRSSA as well, which helped me further understand the profession, and I got involved right away. How did you find internships/jobs? Primarily through networking. 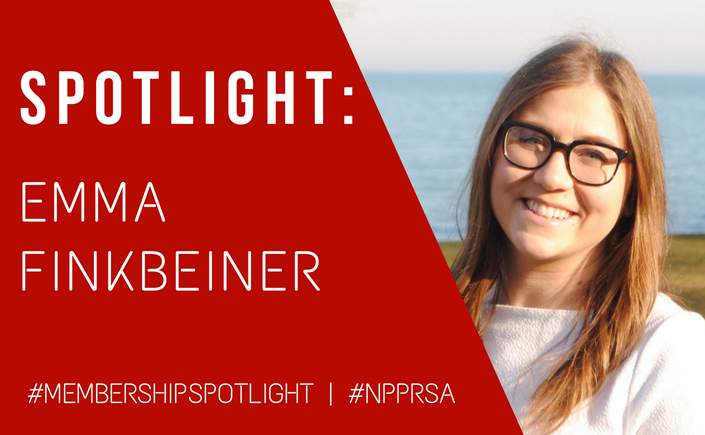 By getting involved in PRSSA and taking on leadership roles, I was able to travel to events all over the country and meet so many people. I would say all of my internships and jobs have been touched in some way by a connection I made through PRSSA, whether this person wrote me a recommendation, worked for the organization or just told me about the opportunity. What was the biggest challenge you’ve ever faced in your career? How did you overcome it? My biggest challenge so far was moving into a marketing function with my background being primarily public relations and journalism. However, my master’s degree helped me to grow my knowledge while I started this position and my skills were definitely transferrable. I also wasn’t afraid to ask a lot of questions and took time to expand my skillset by diving in when opportunities to work on something I wasn’t yet an expert in presented themselves. What has been the most valuable thing you have learned through classes or experience? Both my classes and professional experience taught me how to work in teams and how to become a creative problem solver. My classes were primarily project based, allowing me to work with teams of fellow students to take a client challenge and turn it into an opportunity. In my professional experience, I have always collaborated with others. What has been the best piece of advice you have received? Not to take things personally, to be resilient and to never stop learning. Do you have any advice for future PR pros? I value hard work tremendously and have always been willing to go the extra mile, but work-life balance is so important. Bring your best self to work every day, but remember that you are a human being and take time to do things in your personal life that you enjoy. What do you think is the best benefit of PRSA and the New Pros section? The supportive network of professionals. Most of my mentors I met through PRSA and I also really value all of the things I have learned from my peers in the New Pros section. Whether you’re looking for a new job, navigating the transition from student to professional or are just looking for a group of like-minded people, PRSA and PRSA New Pros provides that and so much more. Is there anything you wish you would have known before starting your career? I really only wish I had known about this industry sooner! I loved participating in high school outreach sessions when I was a member of PRSSA because I saw so many students’ faces light up when they were introduced to the public relations profession. Continuing to educate students in high school that this career path is an option is so important so that they can choose from schools with great programs that have PRSSA chapters, which allow them to get involved in their professional development on a deeper level. Tell us a little-known fact about yourself. I’m not sure if I would call this a “little-known” fact, but I am absolutely obsessed with my 2-year-old pitbull Addison. She even has her own Instagram account – @addisonbully! If you are interested in being featured, or interested in nominating someone to be featured as a part of our #MemberSpotlight, please complete the following form.